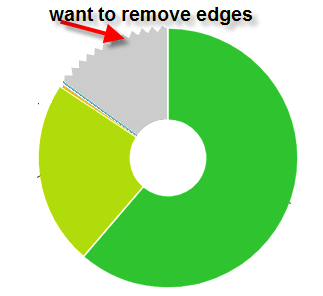 How can we remove edges on pie chart? As per our requirement, we want avoid the edges which are displays in pie chart. So is there any config or any other option available which will remove edges from the pie chart slice. Here, i am attaching snap of the pie chart with edges. To disable these edges from pie chart you need to change "lineDecoration", inside previousStyle and/or othersStyle, that is located inside Slice object. Thanks for the quick solution, your solution is helpful for us.